New to UK Bathrooms! These best selling ceramic shower trays by market leading luxury bathroom brand Villeroy and Boch can now be customised thanks to their ViPrint bespoke printing system. 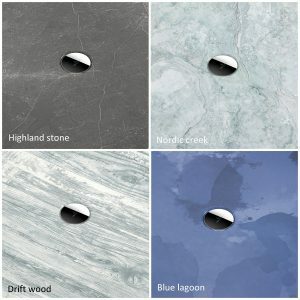 The chosen design is cast and sealed onto the glazed ceramic for a tough and resilient surface pattern that will not fade or discolour over time! 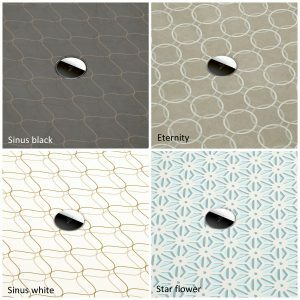 Choose from a huge range of 20 different patterns and colours. These are split into different collections of colours and textures along distinct design themes, allowing for an unlimited number of different looks, there is something for every bathroom and every clients taste within the collection. There is something for everyone and every bathroom in the ViPrint collection. 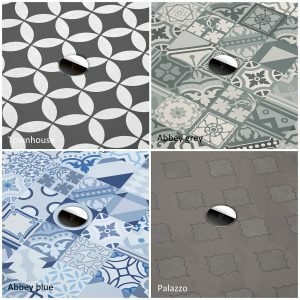 Due to their bespoke nature these are made to order on a lead time of approximatly5 to 8 weeks, place your order today for either the Villeroy and Boch Subway Infinity Rectangular Shower Tray with ViPrint or the square version: Villeroy and Boch Subway Infinity Square Shower Tray with ViPrint.